Hung Hom Station is located right in the heart of Kowloon. It serves as the arrival point for passengers travelling by MTR, Airport Express Shuttle Bus and many other forms of public transport. 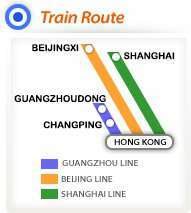 Change to MTR East Rail Line and West Rail Line are available. Both bus and minibus are available at the bus terminus to take you to and from Hung Hom Station. Airport Express Shuttle Buses travelling to/ from MTR Kowloon Station are available.